For over 20 years, Tri-City Crating and Packing has provided San Diego County clients with high quality custom crates and exceptional customer service. We specialize in the safe and secure packing of items of all types and sizes. Some of our professionals have over 38 years of industry experience, so you can rest assured your items are in the best hands. When a shipment does not require a fully enclosed box, we offer open-sided crates as an equally reliable, cost-effective alternative. Great for domestic shipping and clients with budgets to consider, our high quality crates are manufactured to size and customized to satisfy the crating needs of each customer. Our crates are highly engineered and even "over-built" to fully protect your cargo from potential damage. 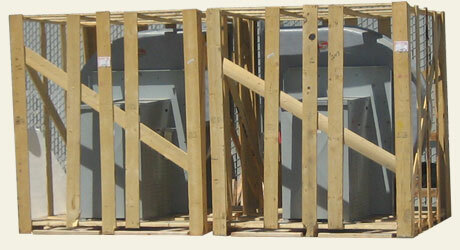 Our skilled specialists will guide you through the custom crate design and fabrication process. We will visit your facility or residence to make assessments and take measurements at your convenience. Our experienced professionals will then deliver your custom crate and pack your cargo on-site. We offer vacuum packing and environmental barriers for added protection against damaging moisture and humidity. Call us today to speak with a friendly crating specialist.